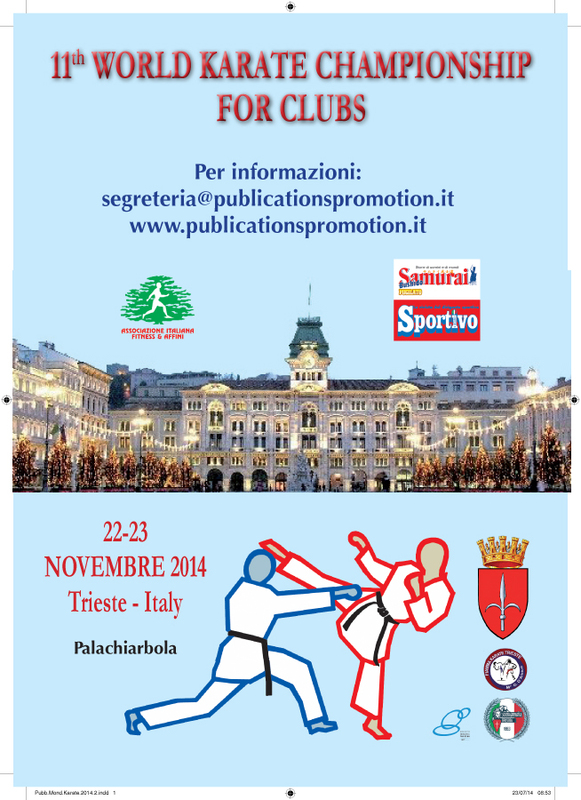 Our great kermesse of karate is arriving this year in the famous and welcoming city of Trieste. The central European city for excellence, where we can breathe the binding of many cultures, you will be fascinated by the its historical coffees, the art, the Architecture and the unforgettable sea…. All Clubs and sport Associations can participate with an unlimited number of athletes. Athletes can be registered to any national or international Federation and Association coming from all Countries and training any karate style. The tournament is open to all and sundry. Seen the large participation, in order to maintain the correct time, the competition will be on 8 tatami. Competition will take place with the division of participants according to their style, that are the following: SHOTOKAN (including Shotokai, Fudokan, etc.) SHITO RYU (which also includes Sankukai, different area school, etc. ); GOJU RYU (which includes area and derivated school) WADO RYU (which also includes SHORIN RYU different area school). The KATA choice is free, but in each match the athletes must perform a different KATA (participants up to orange belt are the only ones allowed to repeat the same KATA in more than one match). In the eventuality of a play-off the athletes must perform a different kata from the previous ones. Judges will give their evaluation using a score system. All participants must be equipped with their own regulation safeties (according to the competition rules that they have chosen). Competition will take place with two different referees’ rules: SPORTS (Shobu Sanbon, and for youth classes as scheduled, Shobu Nihon) and TRADITIONAL (Shobu Ippon). Actually they are two different competitions and athletes can freely choose one or the other one; or both. The choice of rules must be specified in your registration form. The duration of the competition of the Shobu Nihon is one minute and half, whereas that one of Shobu Sanbon and Ippon is two minutes. Cadets A Male -52 -57 -63 -70 +70 Kg. Cadets A Female -45 -50 -55 +55 Kg. Cadets B Male -60 -65 -70 -75 +75 Kg. Cadets B Female -50 -55 -60 +60 Kg. Junior Male -65 -70 -75 -80 +80 Kg. Junior Female - 55 -60 -65 +65 Kg. Senior Male -65 -70 -75 -80 +80 Kg. Senior Female -55 -60 -65 +65 Kg. Children A Male -30 -35 -40 +40 Kg. Children A Female -30 -35 +35 Kg. Children B Maschile -35 -40 -45 +45 Kg. Children B Femmine -35 -40 +40 Kg. Children C Maschile -40 -45 -50 +50 Kg. Children C Femmine -37 -42 +42 Kg. Children D Maschile -45 -50 -55 +55 Kg. Children DFemmine -42 -47 +47 Kg. Athletes participating in the Sbobu Nihon competition in the categories children a/b/c will be divided in 2 group: a) till green belt; b)blue brown and black belts. The Children D, always in 2 groups a) till blue belt; b)brown-black belt. All participants in Shobu Nihon must be equipped with their own regulation safeties, included helmets and body protector. Kumite weigh-in: athletes participating in the kumite competition must be at the Sport Center for the weigh-in before competition starts; the weigh-in will be made by sample (allowance on the weight is 500 grams and athletes who will be overweight (out of weight category) will be excluded from the competition). The team Kata competition is all stile. The team will be composed by 3 athletes and 1 reserve, which can be used to replace an injured athlete. The team (without weight categories) will be composed by 3 athletes and one reserve, which can be used to replace an injured athlete, or upon request of the coach. However, the replacement can be done only in the following round. At the beginning only 3 team athletes, without the reserve, will line up in the area of competition. A team with only 2 athletes at the beginning will not be allowed to compete and will be declared loser (kiken). If during the shift, one of the members of the team members is injured and the doctor notice him/her unfit to continue the match the team can continue the match with only two athletes. 1) All competitors, under the President’s responsibility of their club/association, must have regular sanitary certifications according to the laws in force in their own Country and they must be covered by their own insurance. On request the athletes must show a valid identity document and the federal membership card (certifying the grade owned). 2) If during the competitions some categories will have a poor number of athletes registered (less than four) the Organizing Committee will unquestionably arrange the passage of these athletes to the closer category. 3) Seen the nature of this event no claim will be accepted. Possible pertaining appeals must be immediately made in writing to the Chief Referees, paying the fee of Euro 50,00 (that will be returned if the appeal will be upheld). 4) The organizing committee declines all responsibilities for any accident in which people or things may incur before, during and after the event. 5) When the Sports Clubs register their athletes, they take upon themselves the responsibility that their own athletes are in conformity to the health certificates and everything provided in the present regulations. The first three classified athletes of each category and each competition will be awarded by medal and certificate. All participants will receive a gadget of attendance, as well as the first four clubs in kata (with different final results for every style) and the first four clubs in kumite (with different final results for every rules). At the end of all competitions there will be also a further awards ceremony of the first absolute three clubs (which will sum up both kata and kumite scores). A GREAT reportage of the competition on our magazine Samurai. Registrations must arrive not later than 15th November 2014 on our site www.federkarate.net or by mail fik@federkarate.it. Registration fee is € 25,00 per athlete and per speciality and € 50,oo for each team. It’s clear that if competitors will be registered and they will be absent, registration fees will not be given back. All the registration fees will be paid directly on the spot (ONLY BY CASH) at your arrival before competitions start. Really because this event would be an unifying moment, independent from the Federal name of belonging. The participants Club/organizations could participate also with their referees. Who would like to come should have to send their availability (indicating the level and the mail address) within and not later then the 31 October 2014. After this date the organization will go on with the convocations, till the required numbers. Before the beginning of the competition there will be the arbitration meeting. Everyone who are interested in the accommodation (indicating the necessity) could ask on request a quotation at the best conditions.